Roberto's Taco Shop was San Diego's first walk up and drive-thru taco shop, setting the standard for fresh, authentic and inexpensive Mexican food. Combining a passion for good ingredients with friendly service and a welcoming environment is what has made Roberto's a pioneer of classic Mexican food for over 50 years. Beginning as a family operated business in 1964, and continuing to this day to be family-run, Roberto's has over 65 taco shops and remains the pioneer in fast, traditional Mexican food with shops in California and Nevada. All combination plates are served with rice & beans. Topped with lettuce, cheddar & Cotija enchilado cheese. The shredded beef in the burrito is cooked with bell pepper, onion & tomato. Topped with lettuce, cheddar & Cotija enchilado cheese. 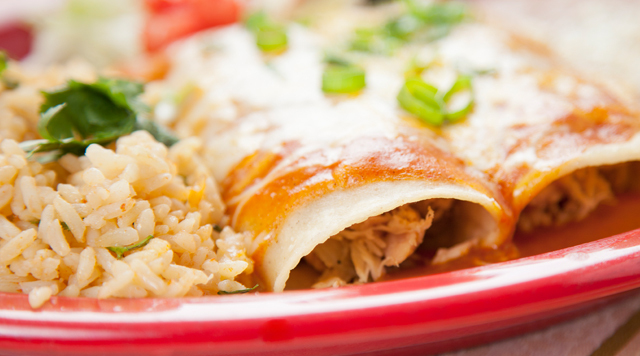 Chicken enchilada has bell peppers, onion & tomato. The chile relleno is a Pasilla pepper battered, stuffed with Monterrey Jack cheese, & topped with enchilada sauce, cheddar & Cotija enchilado cheese. With potatoes, eggs & cheddar cheese. Eggs, potato & cheddar cheese. Eggs, Ham or Bacon, potato & cheddar cheese. Eggs, Sausage, potato & cheddar cheese. Eggs, steak, potato & cheddar cheese. With beans & cheese inside topped with guacamole, sour cream, cheddar & enchilada cheeses & garnished with lettuce & Salsa Mexicana. Carne Asada beans & cheddar cheese in a crispy burrito. Topped with guacamole, sour cream, cheddar & Cotija enchilado cheese. Garnished with lettuce & Salsa Mexicana. With homemade enchilada sauce topped with lettuce & cheddar & enchilada cheeses. Cheddar cheese in two corn tortillas, topped with our homemade red enchilada sauce, lettuce, cheddar & Cotija enchilado cheese. Shredded beef (cooked with bell pepper, onion & tomato) in to two corn tortillas, topped with our homemade red enchilada sauce, lettuce, cheddar & Cotija enchilado cheese. Chicken (cooked with bell pepper, onion & tomato) in to two corn tortillas, topped with our homemade red enchilada sauce, lettuce, cheddar & Cotija enchilado cheese. With lettuce & cheddar & enchilado cheeses. Topped with beans, lettuce, cheddar & Cotija enchilado cheese. Shredded beef (cooked with bell pepper, onion & tomato) topped with beans, lettuce, cheddar & Cotija enchilado cheese. Chicken (cooked with bell pepper, onion & tomato) topped with beans, lettuce, cheddar & Cotija enchilado cheese. Beef steak topped with beans, lettuce, cheddar & Cotija enchilado cheese. Shredded beef cooked with bell peppers, onions & tomatoes. Crispy fries topped with cheddar cheese, beans, sour cream, guacamole, Salsa Mexicana, beef steak & Cotija enchilado cheese. With beans, guacamole, sour cream, Salsa Mexicana & enchilada cheese. Corn tortilla chips topped with cheddar cheese, beans, sour cream, guacamole, Salsa Mexicana, shredded beef (cooked with bell peppers, onion & tomato) & Cotija enchilado cheese. Corn tortilla chips topped with cheddar cheese, beans, sour cream, guacamole, Salsa Mexicana, chicken (cooked with bell peppers, onion & tomato) & Cotija enchilado cheese. Corn tortilla chips topped with cheddar cheese, beans, sour cream, guacamole, Salsa Mexicana, beef steak & Cotija enchilado cheese. Cheddar cheese on a flour tortilla. Shredded beef (cooked with bell peppers, onion & tomato) in a cheddar cheese quesadilla. Chicken (cooked with bell peppers, onion & tomato) in a cheddar cheese quesadilla. Beef steak in a cheddar cheese quesadilla. Topped with guacamole, cheddar & Cotija enchilado cheese. Topped with sour cream, cheddar & Cotija enchilado cheese.